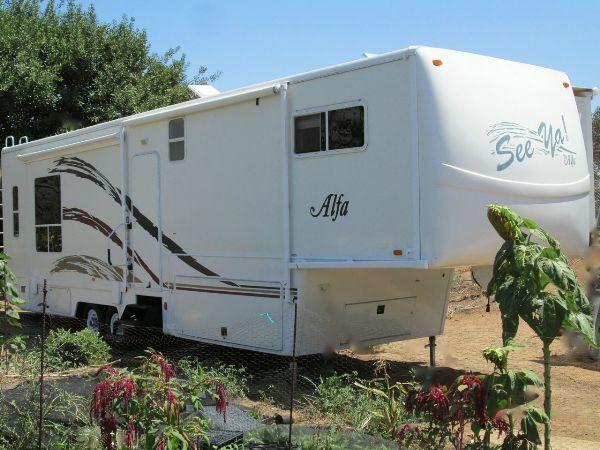 2006 Alfa See Ya 35RLIK,TRAVEL IN COMFORT 2006 36 ALPHA SEE YA !!! ***INTERIOR- 3 LARGE SLIDES- Deepest tallest slideouts - up to 46 deep! Spacious interior 8 tall interior living room and kitchen. Lots of cabinet and outside storage. Smoke and pet free. ***ISLAND KITCHEN - 2 Refrigerators (recently replaced new, under warranty) with 4 separate doors. Ice maker. Many cabinets and pantry space. Corian countertops, Microwave oven. Propane 21" oven with 3 burner range with high output burners. ***LIVING ROOM - Free standing Dining Table, Tan Microsuede Love Seat, 2 Leather Recliners, Ceiling Fan. Lots of overhead storage. Day/night shades. ***UPSTAIRS BEDROOM - With Cal King Bed. Great overhead and directional reading lights. Mirrored closet and built in dressers with oak front drawers. Nice open-view panoramic window. Under bed storage. 2 privacy doors for shower and bedroom. Bedroom TV. ***BATHROOM - Stand up shower. Fully enclosed toilet. Frosted window. ***EXTERIOR 3 LP Tanks for extended boon-docking. Outside shower. Like new tires. Brakes and bearings serviced at Camping World. Tinted glass windows. Exterior and convenience lighting in many locations. Voluminous basement storage. Huge clam shell front cap, for fantastic views from the bedroom. ***Tow vehicle available if desired. CHEVY SILVERADO 1 TON dually, 4 door, white exterior, gray interior, - - - Comes with AirSafe 25,000 lb. 5th wheel hitch. ***Call us at 702-349-6304 and leave message. Stored in north San Diego. California. $39,900.00 702-349-6304.